Named after a mud block house that was built in the founding vineyard, the Mud House Wine Company produced its first wines in 1996. 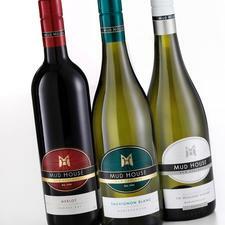 Through acquisitions, Mud House is releasing wines from across New Zealand’s key wine growing regions. Varietals sourced from regions such as Central Otago, Gisborne, Hawkes Bay and Waipara will join the already award winning Mud House Marlborough Sauvignon Blanc. The winemaking team adheres to a strict philosophy of non-interventionist techniques, believing that the best possible wines will naturally express themselves through the unique terroir. As a result of these ideal soils, the wines possess a spectrum of exciting flavours.